Fiona is tired of running. She'd made one stupid mistake, by the name of Garret. Pregnant and on the run, she collapses near a small town. Lucky for her, Aidan happens along. Aidan Forrest first notices the car on the side of the road. When he gets closer and sees a woman slumped over the steering wheel, he rushes to check on her. Imagine his surprise when he sees that she's pregnant. Fighting an attraction for his unexpected guest, Aidan wishes that Fiona would be more open with him. He knows that she's in trouble; just one look into her haunted eyes tells him that much. With Garrett on her trail, Fiona knows she can't stay with Aidan for long. But oh how she wants to! Being in his arms makes her feel safe, something she hasn't felt in quite a while. Is it foolish to wish she could have a happily ever after? Or will her wish come true? "... a charming romantic fantasy... It's perfect for a romanctic reader to finish off in a relaxing afternoon with a cup of tea or two beside the laptop." 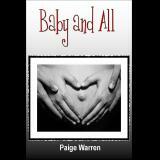 "Paige Warren delivers a wonderfully romantic romance short story that will keep you reading from start to end." "The suspense centers on the inevitable confrontation, and the mounting tension gives the love story a certain poignancy. Amidst the threat of violence, impending and foreboding, we are treated to fairy tale romance involving players who never dreamed it could be so right."